D-Tools Adds Commercial-Focused Enhancements to System Integrator 2018 at InfoComm | KMB Communications, Inc.
CONCORD, CA (May 2018) D-Tools, Inc. has implemented enhancements to the world’s most widely used and comprehensive estimation and budget, design, and project management software platform, System Integrator, including System Integrator 2018. Showcasing new feature improvements at InfoComm 2018, D-Tools continues to find ways to help commercial integrators and technology managers save time and money by reducing redundancies and the chance of errors. Meanwhile, new mobile and web-based features are designed to enhance customer communication and engagement to help projects flow seamlessly from the sales and design stage through project management, installation, and service. Accommodating significant growth in primary commercial sectors, System Integrator 2018 provides beneficial new enhancements ideally suited for commercial AV and IT, higher education, and security professionals. The Customer Portal and Mobile Quote 2.0 will also be on display for the first time to the InfoComm audience at Booth C3864. Accommodating a key component of virtually all projects, D-Tools has completely re-engineered its Change Order process to enable the creation of multiple, persistent Change Orders while also adding a new approval process for Change order acceptance. New Project and Catalog improvements allow D-Tools users to clone products and labor items when adding accessories or items to a package – saving time and reducing errors. Service Orders can also now be created for archived projects, allowing multiple packages to be added at once to a project from the Mobile Quote Explorer. Improvements have also been made to D-Tools’ AutoCAD integration, which makes it easier for those using the platform to leverage industry standard engineering drawings as part of their project workflow. Additional support for security customers has been implemented with PSA integration, providing built-in functionality to update dealer cost information on the fly or on a schedule. Enhanced password rules and enforcement settings ensure the security of customer data per the new GDPR (General Data Protection Regulation) regulations. Redesigned for a more intuitive, efficient, and visually impactful experience, D-Tools’ Mobile Quote 2.0 iPad app makes it easy to walk prospective clients through available technology options and seamlessly generate a scope and budget for customer approval at the sales site, leading to much faster sign-off with fewer meetings. The data collected is instantaneously transferred into D-Tools SI for further design development and project management. Leveraging D-Tools’ extensive product library and workflow concepts, such as the specification of devices by location and system, Mobile Quote 2.0 allows salespeople to obtain signed approval of a project’s scope and budget, and even collect a design retainer, in the very first client meeting. For in-house technology managers, Mobile Quote 2.0 can cut proposal creation time in half, reduce the likelihood of multiple proposal revisions, and expedite their ability to get sign-off on a scope and budget. Ultimately, Mobile Quote 2.0 improves the tech manager’s ability to select and suggest to management the products and technologies they feel will be most effective for their projects, while also increasing the throughput for system designers. The increasingly mobile workforce demands easy access to documents from anywhere and at any time. D-Tools’ new Customer Portal facilitates collaboration and increases client engagement across distances, time zones, and mobile platforms. Users can share proposals, contracts, change orders, drawings, cut sheets, user manuals, and other client-facing documents via the web. To review, comment, and accept (or reject) the documents presented, clients click on the e-mailed link and log in to a secure web portal. This new web-enabled, device-agnostic capability expedites client communication and approvals, to keep projects moving forward and ensure that timelines and budgets are met. The Customer Portal improves efficiency, facilitates better client engagement, and, ultimately, leads to heightened customer satisfaction. To see how D-Tools can deliver profound visibility, insights, and results, InfoComm 2018 attendees are encouraged to visit D-Tools in booth C3864 or sign up now for a free, personal online tour by visiting https://d-tools.com/live-demo-webinar/. You can download a free 30-day trial of D-Tools anytime at https://d-tools.com/hosted-free-trial-signup/. D-Tools, Inc., founded in 1998 and based in Concord, California, is a worldwide leader in accessible, highly accurate system design and documentation software platform. The company’s flagship product, System Integrator™ (SI), is a robust solution that utilizes Autodesk® AutoCAD and Microsoft® Visio to facilitate comprehensive system design, documentation, and project management. 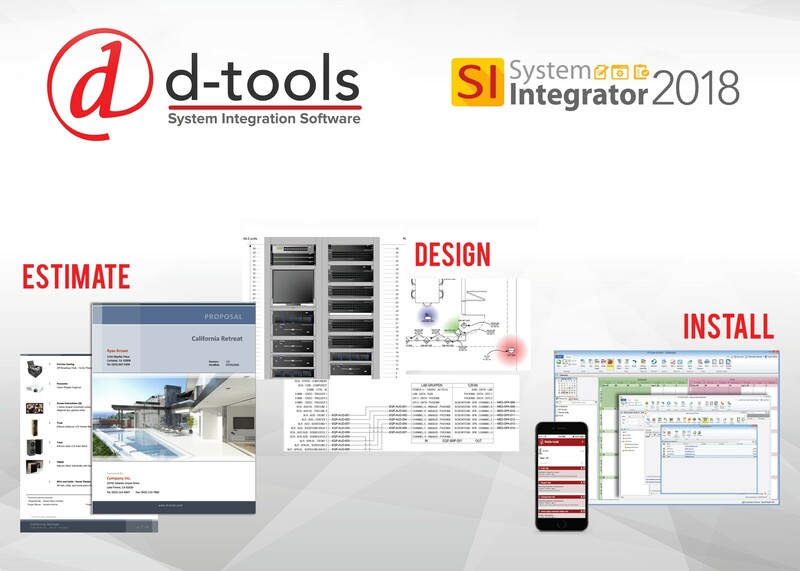 D-Tools enables residential and commercial integrators to streamline business processes and increase revenues while reducing the time and cost associated with the installation and integration of low voltage electronic systems. More than 6,000 leading companies in 87 countries currently use the award-winning D-Tools platform to reduce time, costs, and to streamline the system integration process. Product updates and related information can be obtained by following D-Tools on Twitter, Facebook, and LinkedIn.